The Intune Managed Browser application on iOS and Android can now take advantage of SSO to all web apps (SaaS and on-premises) that are Azure AD-connected. When the Microsoft Authenticator app is present on iOS or the Intune Company Portal app on Android, users of the Intune Managed Browser will be able to access Azure AD-connected web apps without having to re-enter their credentials. Let’s see how simple this is to have a better sign-in experience on iOS devices! Install the latest Intune Managed Browser. 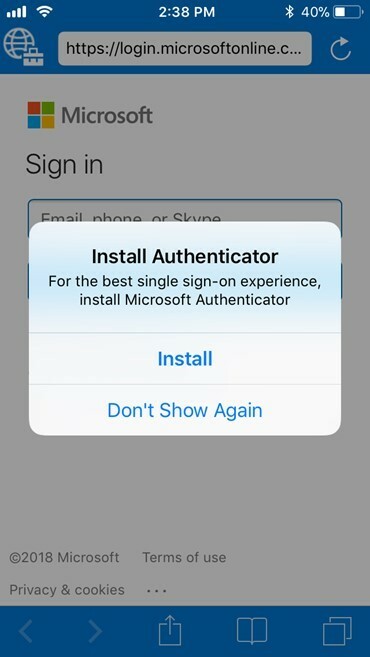 When using the app for the first time, you can take advantage of Single Sign-on by installing the Microsoft Authenticator app. Complete this step.